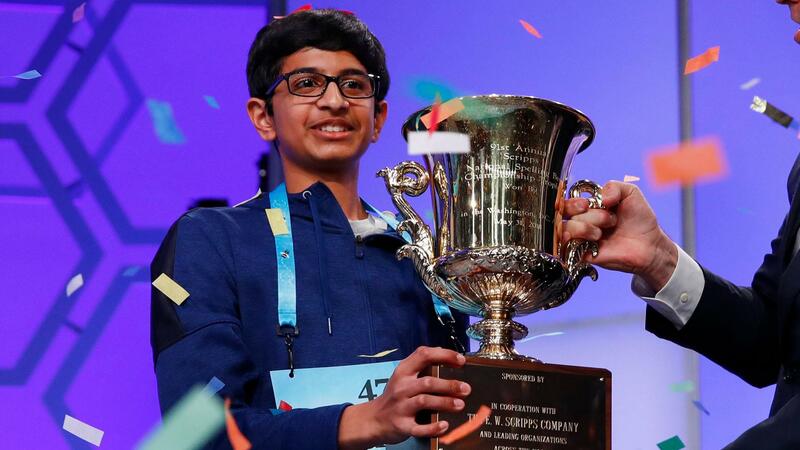 New York, June 1 (IANS) For the 11th consecutive year, Indian-origin children have monopolized the National Spelling Bee crown with Karthik Nemmani winning the 2018 championship, beating out five others in the last rounds. Nemmani, a 14-year-old eighth-grader from Texas, spelt “koinonia” correctly for his victory on Thursday night after second place winner, 12-year-old Naysa Modi, got “bewusstseinslage” wrong. “It’s what I’ve been dreaming of for years now,” Nemmani said. Last week Indian-origin Venkat Ranjan, won the National Geographic Bee, which carries a $50,000 scholarship, beating out two others. The second and third places in the contest, which tests knowledge of geography, were won by Anoushka Buddhikot and Vishal Sareddy. This year 515 contestants participated in the National Spelling Bee championship, the biggest number so far because of rule changes that widened the pool beyond the local champions and also included those without sponsors, who are usually newspapers. The contest held in Oxon Hill near Washington was televised nationally on the sports channel ESPN. In 1985, Balu Natarajan became the first Indian-origin child to win the Spelling Bee and 17 others have followed him. The Spelling Bee is not merely a memory test of exotic words as it also requires learning about the origins of words and the languages they are derived from. Almost a cult among Indian-Americans, Spelling Bees are organised by community organisations and by businesses wanting to reach them. “Koinonia” is “an intimate spiritual communion and participative sharing in a common religious commitment and spiritual community”, according to National Spelling Bee website. The site defined “bewusstseinslage” as “a state of consciousness or a feeling devoid of sensory components”. The third through sixth places went to Abhijay Kodali, Jashun Paluru, Navneeth Murali and Sravanth Malla.